May 11, 2011 May 31, 2012 Nefer Khepri, Ph. D.
I don’t mean to go on and on about this deck, and I won’t, but I felt compelled to say a few more things about it that have been inspired by events at my home and also by tweets with Janet Boyer on Twitter, who also enjoys this deck. Firstly, my 12 year old daughter is interested in tarot. A few months ago she asked me to buy her a deck. She now has two in her collection – Selena Lin’s Manga Tarot and Ciro Marchetti’s Gilded Tarot. Prior to receiving her first deck I did what I do with all my tarot students. I sat her down and took her through the major arcana card by card asking her to tell me how the card made her feel. I use an old Robin Wood deck for this for which I have blacked out the card titles. My daughter would say one to three words on each card. For example, I remember her words for the Empress were: pregnant, rich, and loving. A typical student takes 2 class sessions to make it through the majors. My daughter got through them in about 20 minutes. At that point I determined she was indeed ready for her own deck & proudly bought it for her. She has since been learning the tarot on her own making it very clear she doesn’t need her old mom to show her the ropes. When I get a new deck she must, of course, examine it and attempt to use it. While working with The Journey Oracle for my review the deck kept disappearing on me. I would always find it in her room. When she found out I was writing a review she said, “oooh, let me write it! I love this deck!” I told her when she’s a bit older she can get her own blog and review decks on her own. She was thrilled with the idea. Janet Boyer & I have been tweeting back & forth about the deck and how powerful a “girl tool” it can be. I wish now I had thought to stress that in my original review. 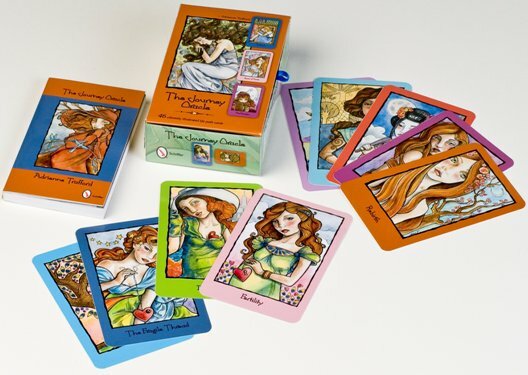 The cards convey very positive traits of strong, determined women who go out & achieve something with their life. Of course, to remain balanced, there are also other cards of not-so-great traits, but every good deck does have balance & sometimes the situations of our lives do bring out the worse in even the strongest and most determined person, regardless of gender. I received a tweet from Janet Boyer who tweeted, “The Journey Oracle is full of girl power. I don’t blame your daughter for wanting her OWN copy! LOL” Janet ~ you have my thanks for inspiring me to write a bit more about this lovely little deck. Yes, this deck is indeed brimming over with girl power for both young and older girls. Now that my daughter is in school The Journey Oracle is back in my office. However, I’m sure later on once she’s back home this deck will once again disappear. It could be worse. At least right now she’s only 12 and not big enough to start borrowing my clothes! Not that she ever would, mind you. In her opinion I have absolutely NO sense of fashion. However, I know a great deck when I see one. Next New Service Debuting This Weekend!